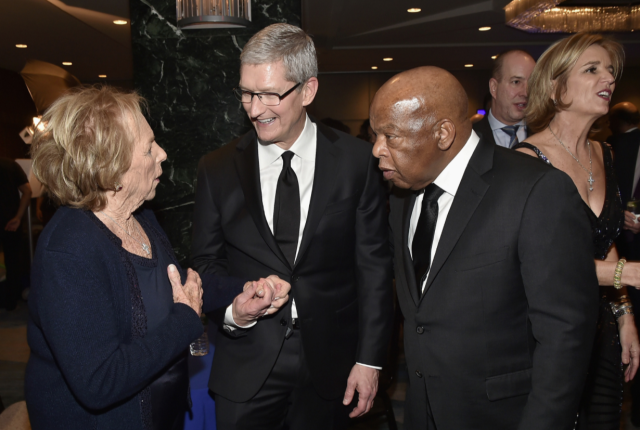 On Tuesday night, Apple CEO Tim Cook accepted the 2015 Ripple of Hope Award at the Robert F. Kennedy Center for Justice and Human Rights and spoke for almost 12 minutes, touching on the headlines of the day and the importance of social change, Bloomberg reports. He also praised Robert F. Kennedy, noting that he has two photographs of Kennedy on his office wall, which he looks at every day. “I think about his example, what it means to me as an American, but also more specifically, to my role as Apple CEO,” Cook said. You can read more about his speech on Bloomberg.